You may face a common problem while using Windows 8. 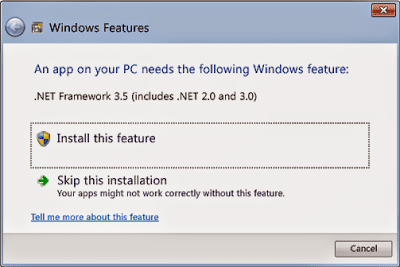 Microsoft .Net Framework 3.5 is not installed with Windows 8. And several programs may ask you install this. And you can't install this from your PC. It will ask you to connect to the net and use Windows Update. By default Windows 8 comes with .Net Framework 4.5 and it doesn't include 3.5. When you try to install .Net 3.5 that you previously downloaded from web the you will see the following message. And you will get the same message while installing some some programs that is developed using .Net 3.5 platform. And you will not able to run those programs on your PC! This is a very bad job by Microsoft. A great trouble for Windows 8 users. But today you will get the solution. You've install this using command line. I mean you have to use Command Prompt. And surprisingly you Windows 8 DVD includes the .Net Framework 3.5! Enter your Windows 8 Installation Disk on DVD Drive. Now .Net Framework will be installed within few minutes. Remember: h is the drive letter of DVD drive. Change it with your DVD drive letter. If you follow all the instructions of method 1 you will be able to install .net 3.5 properly. But if there is any problem for example- you don't have DVD drive, or your Windows DVD doesn't contain it then you can install it directly from Windows Update option. More or less you've to download 200 MB data from internet. Control Panel > Programs and Features > Turn Windows Features on or off > Mark the option .NET Framework 3.5 (includes .NET 2.0 and 3.0) > OK.
Now you will see a window like the image above. Hit on Install This Feature. And make sure you're connected to the net. That's it. Secret Tips: If you upgrade to Windows 8 from Windows 7, then you get .Net Framework 3.5 automatically enabled !! Don't forget to share this troubleshooting tips with your friends. Thanks rahaman. Today you saved me 200mb. You're most welcome! Happy to know that Marks PC Solution helped you to fix something. Many many thanks Dear Mr Abdur Rahaman. I tried several times and failed, now I'll try your tips. It's a big deal to solve your problems! But don't comment before we can solve your problems. Thanx for the comment. Stay with us to get more . . .
Maybe .net 3.5 is missing in your DVD. Please try to install this using a Full Version DVD of Windows 8. And read the whole post again to make sure that you are not missing something. Still you face problem then you've to try the online method. It is written at the last comment. Check this. Definitely! This is the most popular post of this blog. Thanks for the comment. Nobody praise me like you before! Caused me so much problems, thanks Abdur Rahaman. Keep it up dude. I will keep it up for sure. But need your help! Thanks for the post it helped me. You've to manually perform this process . . .
wht is the solution of this type of error..? Excellent comment dude! Stay close . . . I am not able to activate w8 Enterprise X64. When i click on the activator it opens cmd window and closes my explorer. Then there is no sign of activation. Actually this is about .Net Framework. You should write this on Windows 8 Activator related post. By the way, some of the users reported problems like you. But we never experienced such problems in our test projects. Maybe you're using any third party antivirus. Remove it first. Then try again. What type of error message you're getting. excelent work bro. it working for me. tq!!!! This is really fantastic! WOW! thank you so much Abdur Rahaman! It really works!!! I really appreciate and thank you for this tips! :D I am so glad you have shared this! :D God bless and more power..
Hmm I followed every step carefully and I'm still encountering a problem. It stops at 65.8% with the error 0x800f081f and tells me that the source files could not be found. Hey, I followed your steps using a windows 8 disk and i'm getting a error 11. How do I fix this? Make sure you've followed the steps properly. And also read the reasons for failure. Read the comments too. If you fail, then install Windows 8 from different disk, or try installing .net with a new disk. A very big Help Mr. Abdur Rahaman, it works.. Thank you very much sir for sharing your ideas.. The answer with the language stamement is far down..
Re install your Windows. Which version it is? The best solution is re-installing windows. After installing the Windows, install .net 3.5 immediately. Make sure Windows Disk is inserted. And don't change your language settings before installing 3.5. 64 bit windows often have this problem.